70 pages | 13 B/W Illus. The emergence of social networking sites, like Facebook, and people’s engagement with one another through them is a relatively under-researched area for discourse analysis. The content of the book revolves around Discourse Topic Management which is under the theme of Discourse Analysis. It is written to extend the very limited literature in the area of Discourse Topic, especially for the discourse which takes place on social networking sites. This study discusses the characteristics of topical actions employed by English language teachers and their Facebook Friends in managing supportive conversations which take place on Timelines. In addition to employing new strategies, enabled by the particular features of the site, the teachers and their Friends also creatively adapt the strategies used in face-to-face conversations to manage their online conversations, thus contributing to the emergence of unique characteristics of discourse topic management in the context of social networking sites. 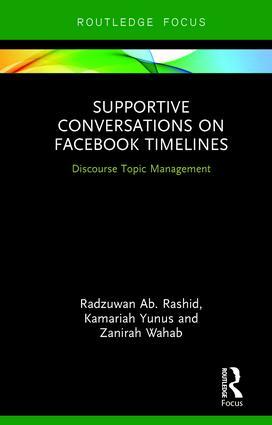 The book brings together the existing frameworks of Discourse Topic Management, which are previously applied in the context of face-to-face conversations, and synthesizes the frameworks for a more comprehensive model into examining the conversations which take place on Facebook Timelines. The novelty of this book lies in its synthesized framework, the recontextualization of the framework for online conversations and the theoretical extension based on the data analysis presented in each chapter. Since people’s engagement with social networking sites is an emerging behaviour, this timely book provides insights into the phenomenon and also proposes a comprehensive analytical framework for other researchers interested in similar contexts. Radzuwan Ab. Rashid is Deputy Dean of Research and Development in the Faculty of Languages and Communication, Universiti Sultan Zainal Abidin (UniSZA), Malaysia. Kamariah Yunus is Senior Lecturer at the Centre of English Language Studies, Faculty of Languages and Communication, Universiti Sultan Zainal Abidin (UniSZA), Malaysia. Zanirah Wahab is Lecturer at Universiti Sultan Zainal Abidin (UniSZA), Malaysia.